That sequence contains more than its share of decidedly un-'80s camera movements and editing, yet the problem with the contemporary trend of handheld, visceral action has never been its use but its overuse. Judicious shot patterns help clarify this and other action showcases in the film while still intentionally disorienting the viewer. The constant entrance and exit of other cars in this early scene serves to constantly upend the action but also displays a carefully choreographed stunt rather than a haphazard maelstrom of movement. Even so, what makes a more memorable impression are those aforementioned moments of Carpenterian camerawork that meshes the dulled metal color palette to create an unexpected sense of melancholy. Hyams then parlays this mood into an elegiac view of the film's returning action superstars, Jean-Claude Van Damme and Dolph Lundgren. JCVD returns as UniSol Luc Devereux, now old and weary and, as is the fate of all once-revolutionary technology, grown obsolete. Called into action when a rogue scientist helps Russian terrorists unleash a next-generation universal soldier capable of tearing through the old models like paper, Luc finds himself caught between involuntary inactivity in his rehabilitation from a life of war to his outclassed status on the battlefield he returns to with equal reluctance. Lundgren makes an even bigger impression with a fraction of the screen time. Playing a cloned version of the psychopath Andrew Scott, Lundgren downplays his genetic copy's mental instability for existential angst. Rather than a mindlessly violent killing machine, Lundgren's Scott asks questions so lofty they sound rhetorical until he acts out aggressively when no one can answer him. Lundgren's vague musings and almost tragic inability to think of anything other than his own existence recall Rutger Hauer's performance as a dying Replicant in Blade Runner. There are even similarities in action—Lundgren dispatches his "father" in the same manner Hauer vents his fears and anger on his creator. When JCVD and Lundgren finally get to fight, both seem so enveloped in their own regrets that the other person serves more as an interruption of their own pain than a nemesis. 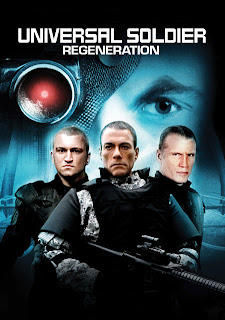 By actually engaging with the realities of its stars' aging, Universal Soldier: Regeneration finds ways to update well-worn material while also having fun with old forms. As intriguing as its character development is, Regeneration never flags as an action film. Blunt, forward-motion direction reflects the juggernaut intensity of Andrei Arlovski's unnamed next-gen engineered soldier, while JCVD's more nuanced tactics get the carefully organized shots to match. His tear through the bad guys' compound at Chernobyl in the climax operates through a simple but balletic entwining of action and camera movement, with the camera gliding around with Luc as he knifes a terrorist and constantly shifts his hiding spots to wait for the screams to draw the next hapless victim (and piece of bait). These days, such spare, effective technique in an action movie is as beguiling the deep pondering of people (or clones) in same.